Sadness is the most comfortable blanket that we, as humans, have to cover ourselves with. I may be weird, but I'm not wrong. There is nothing nearly so safe as an enveloping feeling of despondency. Sure, when we're wrapped up in this blanket, we may end up stifled and suffocated and want out, but to shed our sadness is to let go of a fundamental security. Happiness is unpredictable. It compels us to unknowingly rush toward new hurts. Sadness is what it is. It persists. 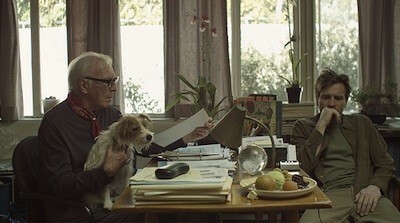 Mike Mills' new movie, Beginners, is about sadness. The follow-up to his good but slightly twee 2005 debut Thumbsucker is the story of one man's lifelong nap in the snug embrace of his personal grief. Ewan McGregor stars as Oliver, a 38-year-old artist who has recently lost his father but gained a dog. The father, Hal, was played by Christopher Plummer, who died of cancer several years after his wife (Mary Page Keller) was cut down by the same disease. It was also then that Hal confessed to his son that he had always been gay, he'd just been hiding it while he was married. This added a whole rainbow of new colors to Hal and Oliver's final years together, in which Oliver acted as the old man's caretaker while the newly freed gentleman refused to tell his younger lover (Goran Visnjic) that he was dying. It's from dad that Oliver inherited Arthur, the Jack Russell who has become his new and constant companion, and who also occasionally communicates with Oliver via subtitles. Yeah, you read that last part right. You might have seen it in the trailers for Beginners. The producers are pushing that part forward, attempting to portray this movie as some precious indie rom-com. It's a disservice to both the film and the narrative device. Even though Mills does have his quirks, including a recurring collage-like voiceover, there is nothing contrived about Beginners. It's a movie by a guy who may be a bit of a kook, but he comes by it honestly and has no need to grab you by the lapels and tell you so. As an artist, Mills just does what he does, he's just himself. The talking dog isn't meant to be a real talking dog, even if the curtain is never pulled back and the psychosis exposed; rather, it's a true representation of how so many of us interact with our pets. We talk to them, and in our minds, they talk back. The conversation gives Oliver a sympathetic ear, and it also reminds him of all he has lost. It also gives Mills some easy shorthand when it comes to establishing the relationship between Oliver and Anna (Mélanie Laurent from Inglourious Basterds). The two meet at a costume party where Oliver is dressed as Sigmund Freud and Anna is dressed in a man's suit and dark wig. It makes her look like an old Hollywood comedian, but maybe that's just because of her laryngitis. She can't speak during their whole first date, and her sketches and pantomime bring to mind great silent film funnymen and maybe even a little Harpo Marx. Regardless, the pair get along smashingly, and if Oliver ever needed any validation of his choice in young ladies, it's when Anna starts conversing with Arthur. It's kind of the same way an animal's behavior can tell you that an earthquake is coming or that you're in a haunted house. If the dog likes the girl, you schnook, you gotta go for it! The narrative of Beginners flips back and forth between the burgeoning romance between Anna and Oliver and the final days with Oliver and his dad. Mills doesn't make any casual moves in his construction, each sequence on the timeline has a corresponding moment. The behavior of the past is reflected in how we deal with the present. Oliver even draws a cartoon illustrating this, with the past embodied by a huge rock crushing a man's head (I assume the future is the pool of blood growing beneath him). Some of the flights of memory take Oliver further back, remembering his childhood and his close relationship with his mother, an unabashed free spirit who lived every moment as if she were still a child herself--something we see quite clearly that Oliver is incapable of doing himself. The fruit has tried to roll as far from the tree as it could, and so Oliver overthinks everything. Ewan McGregor turns in a marvelously empathetic performance. He could have phoned it in, let the material carry him, and just walked through his scenes looking glum, but if we take Anna's advice and watch the man's eyes, we can see how much all of this thinking is weighing on him. The nostalgic reverie leads him to ponder how his parents loved one another. The father's message in the here and now is to stop denying your true feelings, no matter how convenient that denial makes things. Anna is a French actress who has her own trouble making permanent interpersonal ties, but so what? Her hang-ups are no worse than his, and when they are together, they both want to try to be better. Their interactions are sweet, and Mélanie Laurent sells an old kind of silly romance with a charm that transcends type. I daresay there may not have been this appropriate of a match between a pair of neurotics since Woody Allen and Diane Keaton in Annie Hall. There's a general refusal to put on rose-colored glasses throughout that makes Beginners refreshing. Yes, the courtship can be cute, but it is also fraught with mistakes. In the same way, Hal's gay liberation doesn't mean instant happiness. The homosexual community is portrayed as imperfect, and the May/December romance is no fantasy paradise. Visnjic's character is a bizarre manchild with daddy issues, and Plummer's most heartbreaking moment is also the one where the acting is at its smallest: the raw admission that Andy isn't monogamous. It's clear Hal wishes he were, but the elderly man has learned to accept that we take the bad with the good. Sometimes love isn't just about letting in the things that scare us, but also accepting a little hurt in order to have the corresponding joy. I went into Beginners expecting to see a comedy. That's what it seems like the studio is pushing the movie as. Sadness frightens men with money, and they want you to think the warmth Beginners generates comes from a much more convenient source. Even when I left, I saw the smiling and happy poster advertising the movie in the lobby, and I pointed at it and said, "That's not the movie I saw." Which isn't a bad thing, I loved Beginners, I loved it for what it actually was. It's better than what they are trying to market it as! There's always the fear, though, that mishandling a film's commercial advertising will dissuade the right people from seeing it and make those who do buy a ticket think they got sold a bill of goods. (Example: Anton Corbijn's The American.) Fingers crossed that the same thing won't happen here. 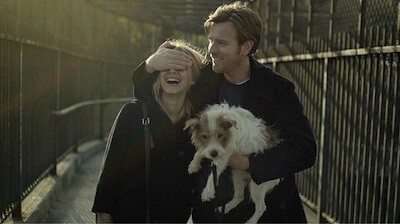 Beginners is a special film; seek it out. Buy tickets to "Beginners" now!